A night of showmanship and great music from Ghana’s top entertainment figures came to display at the 2019 edition of Vodafone Ghana Music Awards nominees jam in the Garden City. A mammoth crowd thronged the Kumasi City Mall to witness great performances from dancehall, highlife, hip-hop, gospel to afrobeats stars. The nominees jam, which is a kick-off event leading to the awards night, returned to Kumasi after seven years. The curtain was raised by some young talents in Kumasi including “Biibi Ba” featured artiste, Amerado. Kwaku Gyasi, one of the finest gospel stars from Kumasi, gave a nostalgic performance, proving to the massive crowd that ‘good music never dies.’ He gave a live performance and thrilled the crowd to his old classics. All round entertainer, Lil Win, took over the stage to enthral the crowd to his hit songs. And while performing, he gave out free Kpo Keke branded t-shirts to the fans. Exciting new duo, Dope Nation proved why they were nominated in the “Group of the Year” category at this year’s awards by treating the crowd to their crazy jams. RuffTown Records’ leading act, Wendy Shay wasn’t left out of action on the night. From “Astalavista” to “Masakra”, the afrobeats newcomer – who earned several nominations at this year’s awards – blazed the fans. Kumasi-based rapper Flowking Stone showcased a delighting performance and brought on stage his brother, Kunta Kinte, to throwback to their old classics. The show, however, paused for nearly one hour when gospel songstress Obaapa Christy’s microphone went off. 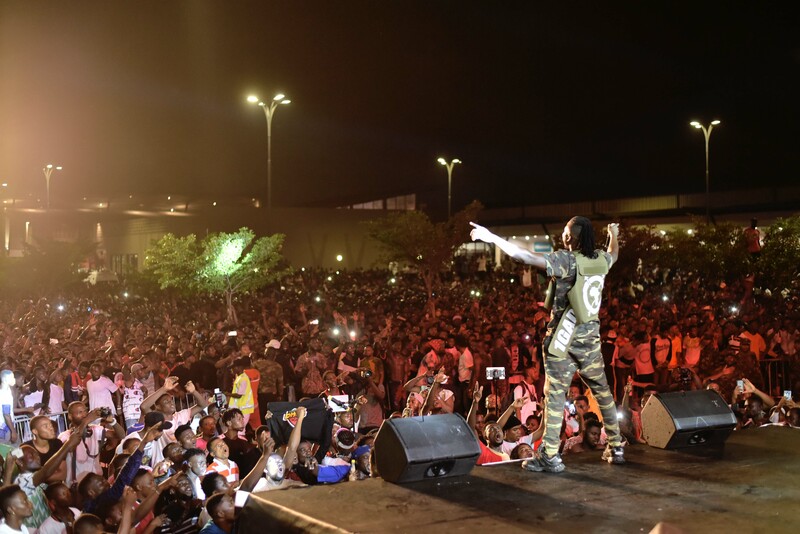 Fans of Shatta Wale started yelling for him and the organisers – Charterhouse Ghana – had no option than to bring him on stage immediately. The SM Empire label frontman came on stage, dropping hits after hits from his catalogue. Tema native Ponobiom took over the stage to deliver one of the best performances on the night. The eight-hour show was closed by Stonebwoy with a calm, transfixing performance. From “Tomorrow” to “Kpo Keke”, the Burniton Music Group brought the obstreperous crowd under control. “Unsung” nominees including Mr Drew, Unyx, OV, Kula and Efe Keyz were also given the chance to showcase their talents.